Which X Series camera should you buy? Fujifilm has just taken the wraps of the X-H1, its new flagship X Series camera. So how does the X-H1 compare to the fabulous X-T2, a camera that it sits above in the Fujifilm range? Both share the same 24.3MP X-Trans CMOS III sensor, so which camera is the one for you? Let's take a look at some of the key differences. While the X-T2 relies on specific lenses for image stabilization (those designated OIS), the X-H1 for the first time in a X Series camera features in-body image stabilization, that promises to offer up to an impressive 5.5-stop compensation. The X-T2's electronic viewfinder impressed when we tested it, but the X-H1 is that bit better. While both are the same size at 0.5-inches roughly, the X-H1's resolution of 3.69-million dots is an improvement over the X-T2's already impressive 2.36-million dots. Interestingly, the 0.75x magnification offered on the X-H1 is a slight regression on the X-T2's 0.77x magnification, but both have a display lag time of just 0.005 seconds and a refresh rate of 100fps. The minor difference here is that the X-T2 achieves this frame rate in a Boost mode (and requires the VPB-XT2 battery grip), and would otherwise by running at 60fps. Both sport a 3.0-inch, 1.04-million dot rear display with a clever three-directional tilting mechanism, but the X-H1 has the advantage of a touchscreen interface. Just like the X-T2, the X-H1 is dust and water-resistant, as well as being able to operate in temperatures as low as 14°F / -10°C. However, the X-H1 also features 25% thicker magnesium alloy compared to the X-T2, while the camera also features a high quality, scratch-resistant coating. The X-H1 is a bigger camera overall as well, measuring 139.8mm (W) x 97.3mm (H) x 85.5mm (D) compared to the X-T2's dimension's of 132.5 x 91.8 x 49.2mm, while it's also a little heavier at 673g compared to the X-T2's weight of 507g. The design of the X-H1 is a bit of a departure from the X-T2, and borrows some design elements from the medium format GFX 50S. The most obvious addition to the X-H1 is a much more pronounced handgrip, while there's now a 1.28-inch LCD on the top of the camera, emulating the design of the GFX 50S and displays key shooting information. This does mean that the handy exposure compensation dial on the X-T2 has disappeared. There's also the arrival of a dedicated AF-On button at the rear of the camera for back-button focusing, while the buttons on the rear of the X-H1 have been enlarged and improvements made to the grip of the front and rear command dials. Both the X-H1 and X-T2 both feature the same hybrid AF system that employs both phase-detection and contrast-detection points. This sees up to 169 phase-detect points arranged in a large square formation (13 x 13) in the centre of the frame that's supplemented by two grids of 6 x 13 contrast-detect points either side to deliver a total of 325 focusing points across a large area of the frame. With the X-H1 though, Fujifilm has improved the AF algorithms. This has led to the low-light limit for phase-detection points improved by approximately 1.5 stops from 0.5EV to -1.0EV, while the performance at minimum aperture has also been expanded from f/8 to f/11. For instance, phase-detection AF can now be used when using the XF100-400mm f/4.5-5.6 R LM OIS WR with the a XF2X TC WR teleconverter. There's also be major improvements made to the AF-C performance while operating in zoom, which should make the X-H1 more suited to shooting fast moving subjects. Both the X-H1 and X-T2 offer 4K recording (3840 x 2160), but the X-H1 also offers DCI 4K (4096 x 2160) at up to 24p. The X-H1 also has the edge when capturing Full HD footage, capable of shooting at up to 120p compared to the X-T2's 60p. 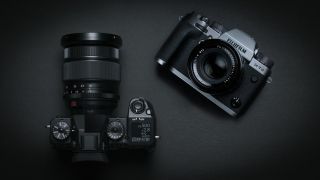 Fujifilm's also doubled the bit rate on the X-H1, increasing it from the X-T2's 100Mbps to 200Mbps, while it also offers a 400% dynamic range setting and a ETERNA film simulation mode that simulates cinematic film, creating understated colors and rich shadow tones according to Fujifilm. While you'd expect the X-H1 to have an advantage here, they're both the same, with a top burst shooting speed of 14fps (with the electronic shutter), dipping to 8fps should opt for the mechanical shutter. Both see a boost in performance if you attach their respective battery grips, with both the X-H1 and X-T2 capable of shooting at 11fps with the mechanical shutter activated. There's no performance gain if you use the electronic shutter. Both cameras use Fujifilm's NP-W126S Li-ion battery (good news if you're planning to have both cameras in your kit bag), but the X-T2 has the slightly better battery life of 340 shots compared to 310 shots for the X-H1. This can be attributed to a number things, but perhaps the larger viewfinder and in-body stabilization are going to drain the power of the X-H1 a little more.